Smiles of the children when they got the gifts. About two years ago, I created my self-hosted blog website “tumutanzi.com”. To try Google AdSense affiliate program, I placed AdSense advertisement on the blog. To my surprise, I did receive the advertisement revenue twice, which is 155 euros in total. If I want to spend the 155 euro for myself, it may be a flight ticket for travelling somewhere, and that is all. However, I actually promised a blogger that I would donate the money for his charity activity if necessary. When I asked him to accept the money, he said he did not have any practical activity. So I have to deal with the money. 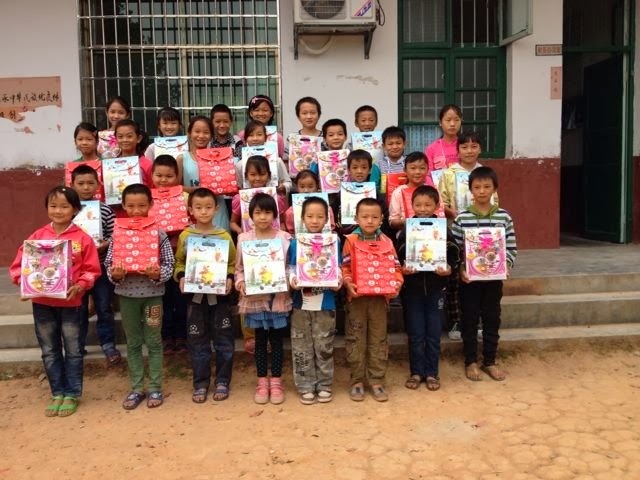 To meaningfully use the little amount of money, I decided that I donate the money to the primary school in my hometown where I studied when I was a little boy: Xinzhou School of Hunan Province. I initiated the so called mini-charity project with the money. Indeed, the limited amount of money (155 euro) cannot solve a big problem even a little one for the school. It is no doubt that the improvement on hardware of the school needs the investment from the local government. What I want to do is that making those children of the school know there is a guy who used to study there and now is paying attention to them, even though the guy lives abroad for the moment. It cannot be better if I can boost the dreams of these children for their future. For the children who live in my poor hometown surrounded by mountains, it is of equivalent importance to have “hope” (or dream) compared with improving the hardware of their school. If I want to do charity activity, it is natural to help some one I am familiar with. Donating the limited money to the school that I know very well, I am pretty sure the money will not be abused as this did happen in China in the past. No matter how little the charity is, it is charity, and deserves to be performed. The 155 euro is equivalent to 1200 CNY (Chinese Yuan) if converted to the Chinese currency. Since I had the idea to donate the ads revenue to the school, I wanted to get some donations from my friends. However, this kind of behavior has no direct yield, not to mention I will not refund the donations, so I did not ask any of my friends, although I donated several times to other projects, such as WIKIPEDIA, iKandou, Dogear Kindle, Wangyue blog, Water Drop Project, WP plugin. Hello, I am also a student originally from a rural area (China). I am touched by you when I knew you decide to donate your ads revenue to your school. I completely know the current situation of rural education in China. I am not a guy who hate the society and the world without any reason, but I am completely disappointed with it, unfortunately, I cannot do anything to improve it. To show my respect to you and also contribute a bit to your mini-charity project, I would like to donate a little money to you. The money is not that much, maybe 10 or 50 CNY, because I am just a college student in the last year and doing an internship job with very limited income. Could you please give me an Alipay account to receive the donation? Influenced by you, I am also planning to create a personal blog, to writing down my personal ideas, such as reading digest, thoughts of daily life: http://muwu.me. The theme of the blog has not been decided yet. I hope I can exchange ideas with you in the future. I do not know what I should reply to this warmhearted email. It is not just a matter of 10 CNY money. What is more important compared with the kindness from the reader? Since the reader with whom I have never met trust me so much, I think it is worth telling them my idea that I would like to accept donations from friends for my school. If we can even call people to pay attention to the education issues in those rural area, it could not be better. Being poor is not the worst, what is really the worst is lacking the chance to change, i.e., education. If you agree with the mini-charity project idea as I aforementioned, and also would like to contribute to the school, you are welcome to donate. Below is the way how to donate. First of all, there is no requirement as for donation amount and nobody is obliged to donate. Even one Chinese yuan (approximate 0.16 USD) is also welcome, it also represents your kindness and I appreciate it. Three months later, I will ask the children and teachers of the school to know what they do need, then buy them those real items using your donations, such as books, items for studying. I do not directly hand the money to the school. (Update: After the discussion with the headmaster of the school, we plan to buy some items to reward best performed pupils.) I will also continue the mini-charity project after three month if everything goes well. To show the power from grass-root netizen like you, I will disclose each received donation in time (to protect your privacy, please indicate if you want to donate secretly). Because of your donations, I will make the whole process open and transparent. I trust the great rules rather than the moral personality of an individual person, including myself. You may wonder why I do that since I am just an average person. Indeed, why do I do that? I also asked myself. The Dalai Lama had learned English and could inspire a Western audience with his deep spirituality, a quality that many Westerners felt was missing from their own materialistic daily lives. Helping other people within the capability of our own is also a kind of belief. The excel sheet at this link shows the received donations since the beginning of the charity project. The post was originally written in Chinese on 16 March, 2013, translated to English on 26 October, 2013. The project is also inspired by the spirit of OBSG where I live. OBSG is an NGO organization which offers service for foreigner students coming from developing countries to Gent University for studying. 大部分竟然能看懂。hope is a dangerous thing，But in here hope is a beautiful face .